It’s that time of year again. I’ve read many a post where the poster apologizes for his lack of bringing timely news. So,i shall save you my further excuses. For those of my friends in the U.S., Happy Thanksgiving to you, may you enjoy this time with friends and family and for friends outside the U.S., my best wishes to you too. 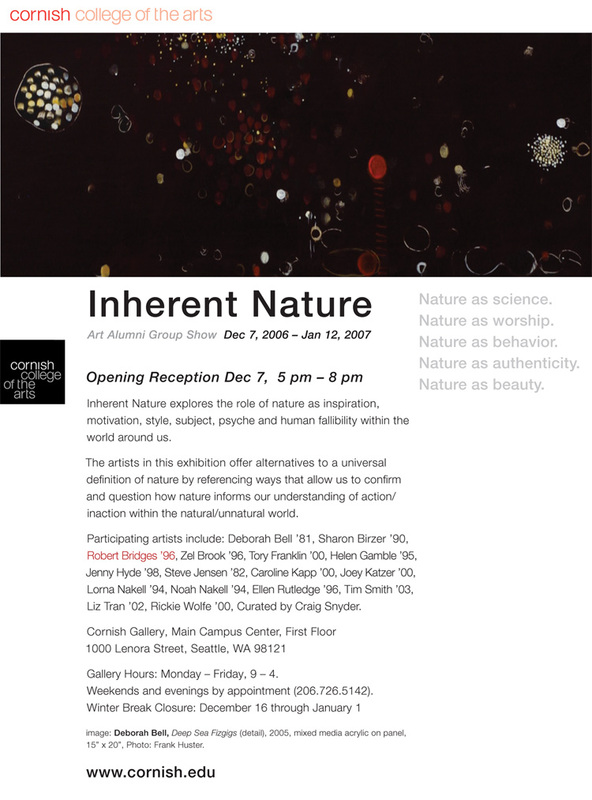 The group show I will be in, “Inherent Nature,” will open in Seattle starting December 7th ’till January 12th at Cornish College of the Arts. You can view the details on the show here. It explores the role of nature and how we relate to it as well as “alternatives” to it’s universal definition …heady. If you happen to be in the area please do stop by. I will also have a limited edition run of holiday cards available for purchase through Vancouver’s very own “Occupied” boutique. I will post more on this next week along with some images of said cards. Many more projects and such are in the pipe, (as they say), over at “Rob Bridges Illustration” and if you wish to be in the loop you can visit my mailing list; and you’ll be notified of new work and updates.